Situated on 20 park-like acres on Waterfall Dr. and surrounded by conservation land, Waterfall Hills offers residents relaxed suburban living in spacious one and two bedroom apartments. Matching the site's natural ambience and spacious residences is its convenience. Shopping, restaurants and entertainment in downtown Canton are minutes away, as are major commuter routes and commuter rail to both Boston and Providence. 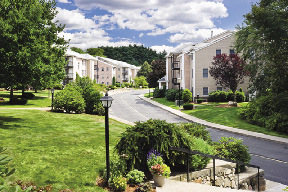 Waterfall Hills was acquired by CHR in 2007 and has since undergone CHR's signature improvements as well as transition to the company's service-oriented style of property management. "This is a hybrid team," explains Sam Smart, regional property manager, "with some staff coming from other CHR properties and some team members having worked at this site for many years. Having people here who knew the property's history and eccentricities smoothed the original transition to new ownership and management. It's a terrific group and they are now operating like a well-oiled machine." The spacious units with their open floor plans are a standout feature of the property, as are breathtaking views. Each apartment features balconies or patios, abundant closet space, private storage, fully-appointed kitchens and in-unit washers and dryers. Private garages are also available. For recreation, residents enjoy a tennis court, fitness club, picnic area, a popular outdoor swimming pool, and a beautifully landscaped sitting area which features a waterfall as its focal point. The waterfall was one of the first things that CHR founder and CEO Ed Zuker noticed when he toured the property for the first time. In fact, Ed was so struck by the feature that he renamed the property Waterfall Hills and dispatched the CHR horticultural team to transform the weed-filled space into the lovely and peaceful area that it is today. Another most often used facility at the property is the dog park. Waterfall Hills is one of a small number of area residential communities that allow residents to have cats and dogs. In the park, residents can let their pets off leash while they socialize with other "guests". The property is popular with young professionals, seniors and young couples.